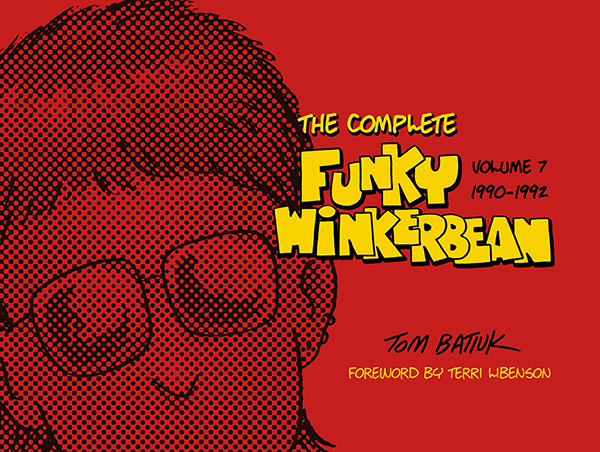 The seventh volume of The Complete Funky Winkerbean drops today and is available for sale on Amazon. It contains one of the true inflection points in the strip where Funky and the gang graduate from Westview High and then time frog forward to a point just after college. In retrospect, it seemed natural and easy, but, in reality, it was touch and go as exemplified by this excerpt from the intro. With everything I needed finally in place for the time-jump, the next step was to present it to the people at King Features. I was going to need their help and support because, while I felt confident that this was the proper move, it still entailed a tremendous risk. Change in any way, shape, or form is anathema to comic strip readers. The syndicates even have a name for a reader’s response to change: the squeal factor. So, even though my confidence in the move was high, I still needed to convince my syndicate and my readers. To their credit, and with my everlasting gratitude, the syndicate’s president Joe D’Angelo, comics editor Jay Kennedy, and the syndicate’s publicist Ted Hannah took me at my word that this was going to be the best thing that ever happened to Funky Winkerbean and unquestioningly (mostly, more foreshadowing here) jumped in to start paving the way for the change. As I mentioned earlier, I had been already doing quite a bit of writing on the side with the future Funky folks and had the distinct advantage of knowing what was going to happen and how things were going to unfold. Somehow I had to relay the excitement and possibilities that I knew were coming to the people at the syndicate. In turn, it became their job to dope-slap me when, in my exuberance, I failed to notice a rather major flaw or two in my planning. For example, I was on the phone at one point with publicist Ted Hannah, regaling him with my plans for each of the characters. I told him how Les, an English major in college, would be coming back to Westview High as a rookie English teacher, mirroring my own experience of coming back home to teach art at Eastern Heights Junior High. I also revealed to him how Bull Bushka, Les’s arch nemesis from high school, would be returning to Westview High to be an assistant football coach and how Crazy Harry would be working as a postal employee (this was around the time that post office workers were “going postal,” and Jay Kennedy was particularly amused by Crazy’s future vocation). After I had laid out the script for most of Funky’s major characters, Ted asked (See? A question.) what Funky would be doing. I laughed and replied that, ironically, of all the characters in the eponymously titled strip, Funky was the lone holdout and that I still didn’t know what Funky would be doing. There was a long pause at the other end before Ted changed from his Bruce Wayne voice to his Batman voice and asked very slowly, and I must say with a slight bit of an annoyed edge, enunciating every word carefully as if to somehow help it penetrate my thick scull, “WHEN . . . WILL . . . YOU . . . KNOW?” I told him I’d call him back in half an hour! Turned out to be one of my better half hours. I spent it frantically trying to determine Funky’s fate. Up to that point I had been pretty casual about it, figuring that I’d just work it out as I went along, but Ted made it clear that he was having none of that. Funky was the main character in the strip, and the first question that every editor in the country was going to ask was the one that Ted had just posed. And I didn’t have an answer! I started running through all of the possibilities, and no job I conjured up seemed to suit Funky. I already had two of my characters returning to the high school, so that wasn’t really an option. I vaguely recalled thinking that Funky had been a business major in college, but it was really a bad time for them because the country was hip-deep in a recession that had been going on for a couple of years and a lot of them couldn’t find jobs. It took a bit for that to sink in before I realized that, like so many other college graduates at that time, Funky would probably be unemployed and living back at home with his parents. So I called Ted back and told him just that . . . and then, as an afterthought, I added that I’ll probably end up having him deliver pizzas for a while at Montoni’s, the pizzeria in the strip. That afterthought probably sealed the time-jump. The circumstances of Funky’s unemployment meant that the strip would continue to be relevant and pertinent, but by tying Funky to Montoni’s, I had laid the groundwork for what would become the strip’s second set piece . . . its second stage. Funky’s relationship with Montoni’s would grow, the apartment above Montoni’s would house a number of the characters (and when Montoni’s later expands, a law office and a comics shop), weddings (plural) would take place there, and, of course, Crazy Harry would be dropping by with the mail every day. Where the high school had been the perfect stage for the young Funky characters, Montoni’s would now give my adult characters a place to perform. It was ingenious. I’d been lucky. I believe it was Thomas Edison who said, “Genius is one percent inspiration and ninety-nine percent perspiration,” but he probably should have thrown desperation into the equation as well. It was a point of personal demarcation for me as well as I grappled with what in many ways was a brand new strip as I moved from a tyro producing a teen strip to an adult who was in it for the long haul. To see for yourself, I invite you you check out the Books section on this website.